For use in all standard breeds raised commercially or as pets. A few drops administered every few weeks (according to the label directions) can help relieve snuffles, pneumonia, ear mites & ear cankers. Snuffles and Pneumonia: Symptoms: Snuffles or colds produce sneezing, watery eyes, and a pus-filled nasal discharge. Watch for rabbits rubbing their noses with their front feet. Check inside the front paws of the animals suspected of having snuffles. Matted fur here can indicate snuffles. Rabbits with advanced snuffles will often have badly matted fur around the nostrils. Frequently snuffles can develop into pneumonia. Signs of pneumonia are difficult breathing and gasping. 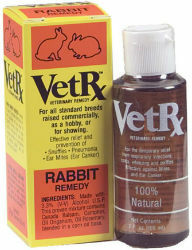 Treatment: Use VETRx™ Rabbit Remedy warm. To warm, place the spout in an open position. Put the bottle in a small pan of water. Heat at medium temperature. Always test the temperature of the product before applying. Place two (2) drops of warm VETRx™ on each side of the nostrils, and to any scabbed area. Repeat two (2) or three (3) times a day until symptoms disappear. Eight (8) drops per gallon in clean drinking water can help respiratory ailments. Ear Mites or Ear Canker: Symptoms: The rabbit will shake its head a great deal and scratch at its ears. Brown, scaly scabs appear inside the ears. Symptoms are caused by tiny mites which burrow into the skin of the ear and cause tissue damage. Check rabbits' ears routinely for symptoms Treatment: Use VETRx™ warm. Shake the bottle well to mix the contents. Apply by the drop or with a cotton swab. Be sure to dampen the entire affected area. Do not dig off the scabs. The scab should eventually be shaken off by the rabbit. After 24 hours, dampen the entire affected area for the second time. Repeat again after 36 hours. Wait three (3) more days and add two (2) drops into the ears. This should result in clean mite-free ears. If, at this time, scabs have not been shaken off by the rabbit, use a damp cotton swab and gently remove the remaining scales and crusts from the ear. Note: VETRx™ will leave an oily film on the skin and fur. This will not burn the skin or remove hair. It is helpful in destroying any mites or mite ova which may be present. General Precautions: While treating infected animals, follow the usual precautions. Isolate infected animals as soon as possible. Clean all hutches and nest boxes which sick rabbits have occupied. Keep rabbits as clean and as dry as possible. In case of snuffles, keep the animals away from drafts. Cold symptoms in rabbits tend to subside and then recur. So, if rabbits have a tendency to catch a cold, watch them carefully for early symptoms. When a rabbit has been to a show, it is wise to isolate it from the others for several days. Treat the ears and nose as described above.